Best Electric Shavers: We cannot stress enough the need to look presentable and good at all times in today’s date. Not only does that result immediately in a terrific first impression, but it is also the best way to keep feeling good about yourself and keep your spirits high. Looking good has many different definitions to a lot of different people, but while that may hold true across all countries and cultures, what remains prevalent is the focus on your face. Facial grooming is what is considered to be of utmost importance. For men, that mostly focuses on keeping their facial hair well-groomed and shaped perfectly. 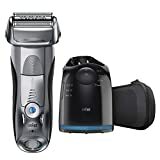 But whether you like your beard trimmed short, shaped into a snazzy design to frame your face, or if you are one who likes to do away with facial hair altogether, getting the best electric shavers is necessary. No wonder, then, that the market is flooded by hordes of new kinds of shavers. In fact, it looks like we can never have enough of new shaving technology, and each new product boasts of some special kind of blade placement that promises men the kind of versatility and functionality that allows them to impress anyone and everyone who comes face to face with them. This article aims to guide you through the many uses (read: versatility) of the best electric shavers of 2019 on the market and which ones you absolutely need in your life. Braun grooming products have always been pricey, but they also figure at the top of many a grooming experts’ lists of the best equipment for all purposes. The Series 9 9090cc electric shaver from Braun is a winner in nearly all of the important aspects. 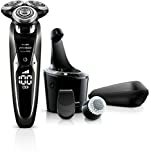 One of the most powerful electric shavers around, thanks to the SyncroSonic technology, it has 4 specialized cutting elements that are perfectly synchronized along with 40,000 cross-cutting actions per minute that prove ultra efficient in tackling different kinds of hair and delivering the most satisfying shaving experience ever. Its fully pivoting shaving head and flexible shears make for the best, quickest shave that goes on super smooth even without the need for lubrication. Its body is designed to be ergonomic so your wrists or grip do not feel uncomfortable during a session. But what makes it our biggest favorite is the 5-way cleaning station that it comes with, which cleans, sanitizes, maintains, and readies the device for its next use. Plus, it is one to last you for years. A truly premium device for those who like a blend of hassle free and luxury. While some buyers may find it unnecessary to buy an electric shaver for over $200, those who have used this once will have a hard time going back. Give it a go if you can’t handle with anything but the best electric shavers for your need, for this one is more like an investment that will stay with you for a long time. In terms of delivering a great shave, the Panasonic Arc 5 is right at the top. Panasonic calls this one of their most advanced electric shavers in any range of theirs, and for good reason. If you have come to believe that electric shavers are less efficient at the actual job than regular razors, then you need to give this one a try. It comes equipped with five ultra precise and extremely sharp blades built with the Nanotech technology. They are also hypoallergenic, so guys will sensitive skin love this one. Powered by a 14,000 cpm linear-drive motor, the Panasonic Arc 5 is easily one of the most powerful shavers on the market. Along with the Multi Flex head and the unique Shave Sensor technology ensure some of the smoothest shaves ever. It is also very versatile, which means you can use it in the shower with a gel or just dry when in a hurry and in need of a quick touch up. The shaver comes in a great design that is easy to grip and maneuver, and the inbuilt trimmer allows you to shape your sideburns too while you’re at it. Thi one also comes with a cleaning-charging dock, so you don’t need to worry about the petty things. It is considered as one of the best electric shavers of current time for sure. VerdictThe Panasonic Arc 5 is easily one of the most efficient electric shavers on the market. Many consider rotary shavers to deliver not so close a cut as that of a foil type. However, the Philips Norelco 9700 is a definite standout among these. To start off, mention must be made of its extremely well designed body and grip that lets you get a comfortable hold of the shaver in times of hurry. In addition to that, it is equipped with cutting edge (literally) technology that results in some of the smoothest shaves you will ever experience. The Philips Norelco 9700 has three rotating heads for this purpose, each of which rotates in 8 different directions to detect different kinds of hair texture and deliver the best experience. The shaving heads of this electric shaver have multiple additional in-built features that add to its benefits. Compared to foil type shavers, this one also results in decreased irritation levels, thanks to the even distribution of pressure across different areas on the face. It is also equally capable as a wet or dry shaver, so have fun using it. Cleaning and sanitizing is aided by the all-in-one charging station, so once you buy it, you’re all set. If you have a preference for rotary type shavers for their convenience but are just not able to find one that compares well against a manual one, then your search for “best electric shavers” ends with the Philips Norelco 9700 shaver. For those who deem it unnecessary to part with $200 for an electric shaver the Remington F5-5800 foil type shaver is a great option. You may think its low price points towards general inefficiency, but that could not be farther from the truth. The Remington F5-5800 shaver is not a wet-dry shaver, but its list of pros far exceed the features it lacks. For starters, it comes with flexibility of options between cordless ad corded use, and in addition to that, there is a 5 minute quick charge function is you’re running low on both time and charge. Add to that a 60-minute cordless runtime and we have a winner among powerhouse budget shavers. The Remington F5-5800 shaver si equipped with two independently floating foils along with what they call an intercept trimmer. The trimmer helps trim down the longer hair on your face first before the foils can shave them off. The floating design also helps the shaver adapt nicely to the contours of your face to deliver a smooth, safe shave. 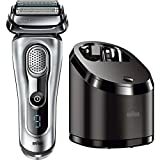 Owing to its price, you will see that it doesn’t come with the build quality of the three shavers listed above, or a self cleaning station either. But being waterproof, you can easily clean it by removing the head and hold it under running water. It is a good option for beginners. As we have said before, the Remington F5-5800 is a great option for those who want to test the electric shaver waters. You might like it enough to stick. If you are tired of getting shave bumps all over your face, or are dissatisfied with the quality of shave that budget electric shavers generally deliver, and yet find it inconvenient to shell out the money for more expensive models, then the Wahl Professional 8061-100 5-star Rechargeable Shaver might be the answer for you. Some experts even consider it as one of the best electric shavers under $75. This electric shaver reduces the possibility of ingrown hair and can deliver the closest and smoothest shave possible. You may have to go through the inconvenience of having to trim down the hair to an even length before using it, for it can snag and pull at the longer hairs, thereby causing pain. But that is the price you must be willing to pay for a smooth shave at this price. Besides its coated hypoallergenic foil that happens to be great for sensitive facial skin, it also comes with the flexibility of corded or cordless functions, so you will be well covered in times of emergency. Be careful and pay close attention to the foils to see if they develop cracks. When they do eventually, it is also easy to find replacements. The Wahl Professional 8061-100 5-star Rechargeable Shaver is a great budget option for those looking for the smoothest shave without the risk of bumps. It has its quirks, but chances are you will get used to them soon enough. The Braun Series 7 790cc is a great option if you’re not willing to shell out the money for the Series 9 shavers, but still want that premium experience. What sets this one apart is its lift and cut system that gently lifts the hair that is lying flat and then cut it down or shave it as you please. There are three different cutting modes for added versatility, and then there is the all-in-one charging plus cleaning dock that simply lets you shave and forget. The powerful motor can reach up to 1,000 micro-vibrations per minute and automatically increases power in areas that have denser hair growth. The head is completely flexible, which means that it adapts well to the contours of your face and provides the closest, smoothest shave without the worry for unsightly and painful cuts and nicks. Like all Braun grooming equipment, this one is a stellar option, so you can give it a try. Even our expert has marked this one of the best electric shavers of 2019. The Braun Series 7 790cc is a great option for those who are not willing to spend more money on the first couple of shavers listed at the top. One of the more modest rotary shavers from Philips is the Norelco 4500, though in no way is it any less efficient. While it is quiet, it is also powerful, and the shave is as good as you will ever get from a rotary shaver, which comes as no surprise as Philips has mastered the art of manufacturing rotary shavers. The Philips Norelco Shaver 4500 model is capable of being used for either a wet or a dry shave, adding versatility to its functionality. That means it is also completely washable, so the lack of a cleaning dock is not worth mourning about. The fully pivoting heads make sure that the shave remains close, even in hard to reach areas of the face like around the jawline. The Dual Precision shaving technology along with the lift and cut system ensures that every strand gets an equal cut. Another big plus og this electric shaver is the battery, which can get a full charge in less than an hour and last a number of shaves on a single charge. The Philips Norelco 4500 is a winner among budget rotary blades. VerdictWe recommend the Philips Norelco 4500 Shaver for anyone looking to try out a rotary shaver that is safe, reliable, and effective. The younger and somewhat less ingenious sibling of the much more expensive and efficient Arc 5, this model is largely capable of doing the same things at almost half the price. Its main distinguishing feature is that it comes with four blades instead of five, which still deliver as close a shave as you will ever get. Equipped with a powerful dual motor design which can deliver up to 14,000 cuts per minute, the Panasonic Arc 4’s shaving head can efficiently lift flat hair off the surface of your skin and hold it for a super smooth shave. The blades are capable of pivoting in every direction for up to 30 degrees, and that along with the flexible head means that the shave will be adjusted to the shape of your face. It can get around problem areas like the jawline or chin effortlessly and without the risk of nasty cuts. It is also equipped with a built-in Pop-Up Trimmer which takes care of your sideburns and moustache. All in all, the Panasonic Arc 4 is a worthy member of the company’s high-end shaving equipment offerings which still manages to fit the budget more comfortably. Be informed that there is no cleaning dock with this one due to the lower price, but getting it cleaned up is pretty easy. If you find the Arc 5 to be a bit to much of a splurge, then you can give the Panasonic Arc 4 a go. 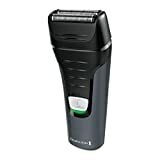 If you are looking for an electric shaver that comes for under $30 and still actually works then look no further than the Remington PF7300 F3 Shaver. This wet/dry unit is equally usable in wither condition, so you can get a comfortable shave in the shower or opt to go dry. The Remington PF7300 F3 Shaver is good looking, and despite the low price, is pretty well built. It is also comfortable to hold and maneuver around the curves and angles on your face. The cut, it delivers is not as close as the more expensive items listed in our compilation of best electric shavers, but it is pretty god for those just about getting started with shaving or for maintenance purposes. For a better and more convenient experience, you can take a look at the more high end XF8700 from the same line. But the PF7300 is quiet, close, and comfortable at an unbeatable price. If you’re a young guy wanting to get your hands on your first electric shaver but can’t be bothered to look after it greatly, then the Remington PF7300 F3 Shaver could be perfect for you. The very name of this electric shaver says a lot for itself, and that is exactly what you will get if you buy the Wahl LifeProof Rechargable Shaver. This model is a standout for its battery feature. It comes with a lithium ion unit that is capable of fast charging, which can get a dead battery up and running for a single shave in a couple of minutes. As an added bonus, it is extremely durable, so rest assured knowing that it will outlast many of the other grooming equipment in your closet. Coming to the kind of shave this one delivers, the Wahl LifeProof Rechargable Shaver is capable of delivering a satisfactory shave, thanks to its dual floating shaver heads with bi-directional intercept cutter which trims the hair down to appropriate length before giving it a closer shave. It is also completely waterproof, so you will face no issues with cleaning it after a shave. There is also a pop up precision trimmer for getting those lines you love sporting so much perfect. Among all the budget options featured on our list of the best electric shavers, the Wahl LifeProof Shaver wins out on its reliability and speed. It causes no discomfort, provides a thorough maintenance, and the battery will never disappoint you. The most obvious identifying feature of an electric shaver is that they run on electricity or batteries. But that’s just the half of it. Unlike shaving razors or other manual options of grooming, electric shavers can be used for a number of functions. In fact, the best electric shavers can do a lot more than just shave; they can also trim your beard, stache, or even your hair to perfection. In short, electric shavers, which are the more expensive cousins of traditional shaving methods, are capable of performing a lot of different functions. But what makes us truly root for the electric variety over manual ones is that they are remarkably safer to use. 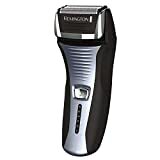 For the best electric shavers are designed not only to shape your facial hair to perfection but also to prevent painful and frankly unsightly cuts from occurring on your face. All you need to do is to turn it on and move it around your face without having to worry about injuries. Another huge plus of an electric shaver is that unlike regular razors, they do not need you to make a lengthy mess everytime you need to shave (which could be as often as every single morning). These compact and convenient devices do not need water or shaving lubricants to be able to provide a smooth and close shave, thereby reducing the time needed in front of the sink, bringing your time to get ready for work down to a minimum. It’s a fact that most men of the world prefer to do their shaving themselves instead of going to the salon every other day, which is both expensive and inconvenient. Not all of us have the time or money to spare. For most of us regular guys, though, we settle for the best facial electric shavers that suit our budget and utility and go for it ourselves. But one other problem right there- so many different kinds and claims clatter the store shelves that most of us tends to get confused. Besides, many among us don’t even know what kind of shaver they should use for their facial hair type. But one thing we will say is that we advocate only the best electric shavers over the manual ones. Frankly, we are all in a hurry to run out the door in the morning, or whenever it is we have to go to work. And considering that shaving is an integral part of our daily grooming routine, it is best to figure out a safer, quicker, and more effective way to get it done. Normal razors may feel more familiar if you have been using them all your life, but when you start using one among the top electric shavers of 2019, you will notice just how easy it makes your life from the very first use. While getting the work done without much of the associated mess and at a much faster pace, you can also consider getting an electric shaver if you’re in the habit of grooming, rather than outright shaving. Want your sideburns to keep looking sharp and mess free? Or wish to trim your beard or stache to the perfect length? Then an electric shaver could be the answer for you if you don’t wish to shell out a whole lot of money at the salon on a regular basis. Another big plus is that some of the best electric shavers come with attachments that also let you maintain your hairdo. So basically, there’s a lot you can do with these nifty little gadgets at the fastest possible time. So get one of them and start saving on time and money both. 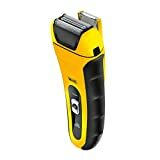 While the best electric shavers save you a lot of time and offer way more effective and safe shaves and trims than manual razor units, they can be quite expensive. That is a common factor for most objects that offer increased levels of convenience. But it is by no means a “buy-and-forget” kind of device. Maintenance for an electric shaver will without question be more of a thing compared to the regular kind. Also, replacing parts for an electronic device is not quite as inexpensive as a manual one. So the first thing that you need to keep in mind before you buy yourself the perfect electric shaver is that it will come with its own set of rules. But yes, your daily life and routine will be made all the more easy with the inclusion of it. So here are a few things to get some clarity about before investing in one. 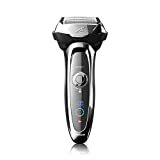 Price: Electric shavers are some of the most widely used appliances throughout the world, so like all other objects that enjoy a similar popularity, these come in hundreds of different brands, builds, and types. Needless to say, while the most basic functions prevail across all similar devices on store shelves, the most major distinguishing factor is the price. An electric shaver will set you back by anywhere around $100, give or take. A little tour of the supermarket isles will also tell you that they can go beyond that as well. However, know that any good electric shaver will meet your most basic requirements. There are two things you can do to get the most out of your money’s worth: you can look back at your daily necessities and gauge what functions exactly you are looking for. Do you need one with a trimmer attachment, or are you happy with simply the shaving bit? Do you need one that’s ultra portable? Secondly, do a quick survey and decide how much you’re really willing to shell out. While it is not necessary for you to spends hundreds of dollars on an electric shaver, remember that the more reputed brands offer better warranties and servicing. Types of Electric Shavers: These appliances come in a lot of different variants, including wet and dry use ones, foil and rotary shavers, and so on. We would recommend that you go for the kind that lets you shave in wet conditions, including in the shower as they make for smoother shaves and easier cleaning. Another important point of differentiation is the presence of an electric cord vs a battery operated shaver. The ones that come with a cord are more reliable as they don’t result in drainage and dying while you’re mid-shave, while battery operated shavers are better for portability reasons. But hey, whoever has not heard of a power cut? So there’s no guarantee that either of these will not falter at a given time. That’s why the best electric shavers that come with support for both are a true blessing. Look for these when you’re searching about. Coming to foil and rotary shavers, the difference is all in the manner of cutting. Both types can come with multiple heads, but rotary shavers come with rotating heads as opposed to the foil types. Users generally opine that foil types offer a closer shave by a fraction, while rotary shavers are easier to clean. Take your pick according to your preference. Cleaning: Being electronic equipment, these shavers might require a little more attention than manual razors. There’s good news though. Most manufacturers keep cleaning as one of the most important factors in mind for better usability. Opting for one that is capable of withstanding running water is always a good option. Remember that your shaver is only as convenient as it is easy to clean. We have counted this as one of the most important factors in our list of the best electric shavers below for convenience. Servicing vs Replacing: Depending on where you live, deciding between whether it will be more convenient for you to get parts of your shaver that need attention serviced or replaced in its entirety is an important one. You might not have an authorized service personnel in your area, or finding parts to replace might be difficult or less cost effective. Remember that some parts will always need to be changed at regular intervals, like the shaving head. A shaver from a reputed manufacturer will require its head to be changed at intervals between some months. Shaving heads are also easy to find. But for other parts that might falter, it might be better to just buy a new one altogether. The points listed above sum up most of the things that you need to keep in mind before you go and buy an electric shaver. Now that we’re clear on those, let’s move on to our compilation of the best electric shavers for this year. We selected the models based on the quality of shave they provide, ease of use, longevity, and user feedback. Let’s get a move on, then. This concludes our list of the best electric shavers to buy this current year. We have tried out best to include only the top electric shavers 2019 from the most renowned brands on the market, and have looked at options that range between $30 to over $200. We trust you will be able to find the perfect equipment for yourself aided by this post. However, if you have tried a number of shavers and have a favorite that we have missed out on, don’t forget to let us know.